Olivier Du Tré Photography Blog: Do you think in images? Do you think in images? Let's start this blog post with saying 'I do!' I can definitely say, I think in pictures. Most of the time it goes something like this. I'm driving around and I see something interesting and even before I get out of the car, I instinctively know what I'd like to see in the viewfinder. I do not often 'work' a scene. When I do occasionally, I can become consumed for hours. Take this image for example. Taken over the weekend. I – O crap I'm gonna say this – 'played' with these trees for the best part of an hour. Waiting for light to change, making different compositions, using different filters and different focal lengths. I shot about 14 frames. And in the end, I kept about 3 of them. This scene was too gorgeous to just drive by. The funny part was, I said to my friend and fellow photographer Kris Schofield that 'this wouldn't take long'.... yeah. I was wrong. Anyway I am digressing. Back on topic. I often think in pictures, in squares and rectangles. It's weird. Sometimes concepts just pop up in my head. I can't help it. Two days ago I was reading about moon eclipses (there was a penumbra eclipse yesterday) when images started popping up in my minds eye. 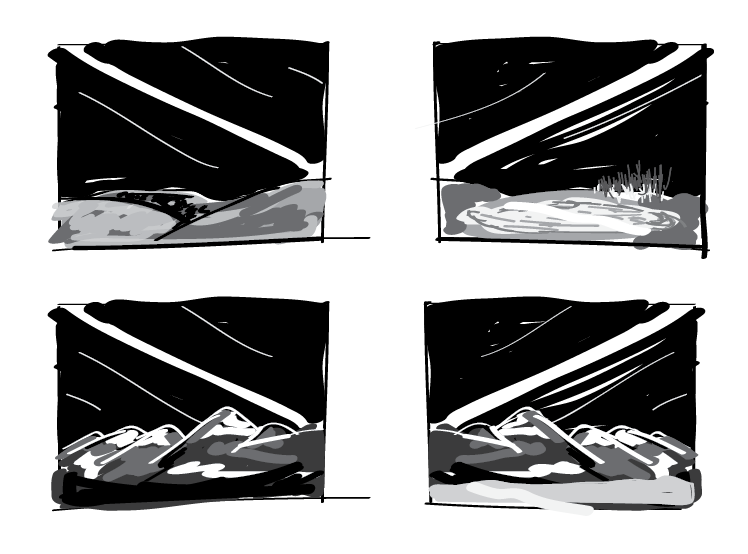 Here's a few rough sketches of what I was thinking about doing. I usually don't make sketches so this is just for illustrational purposes. So don't judge! Usually I store my images in my head. When I was thinking of these, my mind wandered off, already worrying about potential problems. Well let's not call them problems per se. Let's call them 'technicalities'. Before I even attempt to photograph this I will need to know a couple of things. What is the field of view of my lenses? "Why is that important to know?" you might ask. Well there's a few things. Most importantly because it will tell me how long I will need to expose for. You see photographing on film is not the easiest thing. Let me explain. Earth does a 360 spin every 24 hours. So by doing very simple math (and for illustration purposes the moon is stationary) we know that the moon (or the sun for that fact) crosses the sky at a rate of 15 degrees per hour (360 divided by 24, you see math is simple!). That is 15 degrees on the path it is traveling on (not 15 degrees horizontally). That horizontal distance can be calculated by doing trigonometry if you know the 'angle of attack' of moons orbit and the height of the moon above the horizon. But that's not important (there's an app for that and it's called Sun Surveyor) and it is FAR simpler and faster. So let's say, one of my lenses has a 15 degree FOV. To have the moon cross the frame completely I'd have to expose for at least 1 hour. What exposure time am I shooting for? 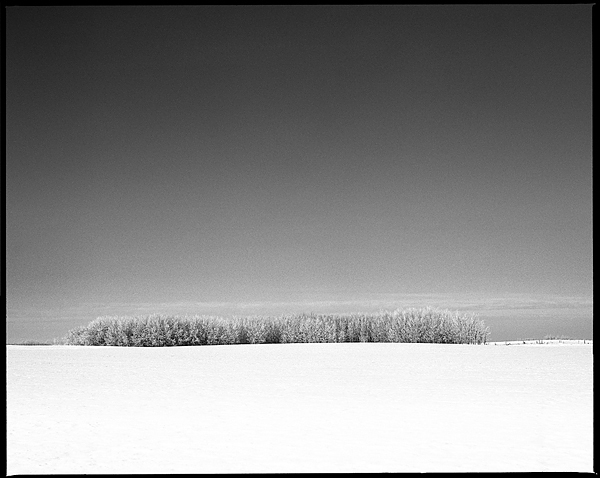 I use Ilford Delta 100 for most of my work. 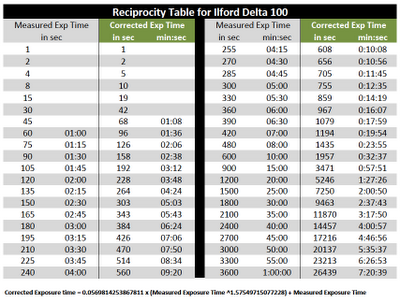 Ilford film though has a very 'steep' reciprocity curve. Actually I found out (by working with it) that the curve Ilford posts in their pdfs is not really accurate. It's is not even close! 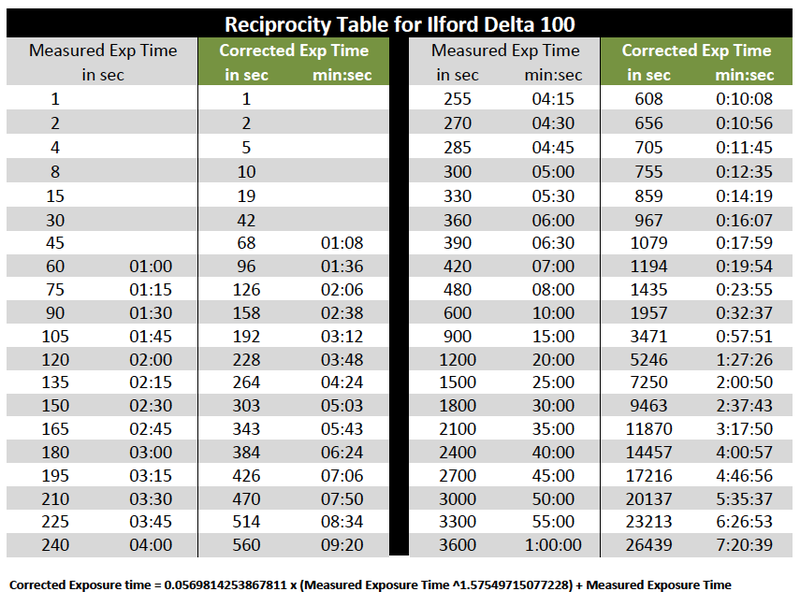 Lucky for me, some guy, did tests years ago on the actual reciprocity law failure rates of Delta 100. And lucky again for me, the internet is an awesome resource when it comes to finding data about the most random subjects. So to make things easier I made this little list and glued that on some cardboard and put that in my camera bag for future reference. BUT how do you know what your measured exposure time is? I mean after all it's pretty dark right? And spot metering in the dark is not possible (unless you know how bright the moon is and go from there). You can do two things. Either make a digital test shot. And transfer everything over to your film camera. OR rely on a second list... (I did the list thing just because I don't like to drag my digital camera around anymore). Here's the second list (it's on the backside of the first list). This basically shows me the average brightness of a night scene. I told ya I was a nerd... Alright now the magic happens. Now we need to find a setting that gives me a 'corrected time' close to an hour and the ƒ stop I need to use. Let's first look at the first list. For a corrected exposure time of about an hour I need a measured time of 15 minutes (second column, it actually is 57 minutes but 60 minutes is close enough). Now let's say we do this project under a half moon. By glancing at the second list, and looking for 'Night, subject under half moon' and then looking for 15 minutes, I now KNOW if I leave the camera open for an hour (with Delta 100) and using an ƒ stop of ƒ8, I will get a neutral exposure (like a zone 5). Now here's comes the pre-visualizing part. How dark do you want to make your photograph? Darker? Turn to a smaller aperture (like ƒ11 (1 stop) or ƒ16 (2 stops). I would not advise to go lighter because after all we are looking for a night scene and the night is supposed to be dark. Now I need to find out when the moon rises and sets and where it does on the horizon. Again there's numerous lists and apps for calculating that. So I won't go into that. Importantly is the fact that you want complete darkness during your photograph. Can you imagine photographing the moon while the sun is rising. Say goodbye to your one frame. And keep in mind, you only get 2 chances per night! Ideally you will need a quarter moon. SO it rises or sets somewhere in the middle of the night when the sun has long gone under the horizon. Also I think the time around the solstices will be best to do this project. The sun really dips low under the horizon and nights can be crystal clear (cold air is more stable than rising hot air and there's less clouds too). The angle of the moonrise or moonset will be steeper in wintertime too than it will be in summertime. The moon kind of does the opposite that the sun. The sun is high in summer and low in winter, the moon does the opposite. Anyway, I can go on and on about astronomy but I'm afraid I'll bore you to death. In the end pre-visualizing a photograph is a very interesting exercise. You should try it sometimes. I believe it can teach you to see, far beyond the photograph. Second of all, it teaches you to think in abstract ways, in concepts. And thirdly it can teach you to do research and to plan to end up with an end result that is awe-inspiring. 'Winging it' is usually not my style. Research is the way to go. But then again I am a geek. A geek maybe, but a thorough one that gets fantastic results from your dedication to research and the technicalities of it all... Great article Olivier.